Strawberry flowers are the means by which strawberry plants ultimately produce fruit. But, they are tremendously intricate. The basics of strawberry flowers will be briefly discussed here, including how they grow from strawberry plants and what to do with them (and when). Strawberry flowers have an interesting life. Different types of strawberry plants produce them at different times. But, since the June-bearing strawberry has captured the hearts and minds of most gardeners who plant strawberry plants, its flowers will be the focus of this post. June-bearing strawberries produce a single crop of strawberries over two to three weeks during the late spring or early summer (sometimes earlier), usually around June (see the Strawberry Varieties page for more details). Like most fruit, strawberries come from the delicate flowers that each strawberry plant produces. However, the small strawberry flowers that strut their stuff in the spring begin their life much earlier. Strawberry flowers originate in the crowns of strawberry plants. Many months before the flowers emerge an grow upward, they begin their life as tiny flower buds within a strawberry plant. This bud formation is critical for next year’s crop and occurs after the harvest is completed. After harvest and renovation (see the Growing Strawberries page for more details), the flower buds begin to form toward the end of summer or early fall. In order for the strawberry flowers to be generated as strawberry flower buds, the plant needs to continue to be well tended. If water is not adequate during the period of strawberry flower bud formation, fewer buds will form. Consequently, the following spring’s harvest will be significantly reduced. If the strawberry plants are well tended, the strawberry flower buds should form, go dormant during the winter, and then burst forth again in the spring. And, the more flowers there are, the more fruit you can harvest! What Do You Do with Strawberry Flowers? For June-bearing strawberries, special attention should be paid to the strawberry plant’s flowers. Generally, if you order strawberry plants online, they will be shipped to you in the spring. Once received, they should be planted as soon as possible. But, if they were bare-root strawberry plants or strawberry crowns only, it is going to take them some time to establish themselves. The plants don’t realize this of course, and will try to produce strawberries by sending forth their flowers. This is not good for the plants or the harvest. The already-weakened plants need all the energy they can muster to take root and make a new home. If they expend the energy on berry production, they will not establish themselves well. This can compromise the plant’s future production as well. Additionally, since the just-shipped plants are weak anyway, they have less energy to devote to strawberry production. This results in smaller, puny strawberries in the same year you order and plant new strawberry plants. Te solution is to pinch off or cut off all flowers from every new strawberry plant for the first growing season, allowing the strawberry plants to root and grow without distraction. Simply check the plants once a week and remove any flowers you find. Most June-bearing strawberries will be completely done producing flowers sometime in July (usually early July). Although not specifically addressing day-neutral or everbearing strawberry varieties here, new plants of each of those types should have their blossoms removed until early July also. However, after July, any strawberry flowers that bloom can be left to develop into strawberries. Strawberry flowers are not all identical. Different varieties have different numbers of petals and relative positions of their strawberry flowers. Some hybrid strawberry plants even have flowers that are pink or other colors. However, all strawberries have flowers. Most strawberry flowers will have 6 petals, but anywhere from 5 to 8 petals on a strawberry flower is not uncommon. There is also variability among strawberry plants when it comes to the position of the strawberry flowers in relation to the foliage. It is very common for the level of the strawberry flower to be even with the foliage or exposed by protruding past the foliage. It is relatively uncommon for the flowers to be below leaf level. Of course, once the heavy strawberries begin to form and ripen, their weight pulls them to closer to the ground. The flowers of strawberries need particular attention during two time periods. First, they need extra care during the formation of strawberry flower buds. As mentioned above, the strawberry plants need an attentive gardener to ensure that conditions are optimal for bud formation. Good care during strawberry flower bud formation yields better harvests the next year. Strawberry flowers also need protection in the spring. Strawberry flowers are rather delicate and can succumb to frosts. So, special attention should be given to the weather forecast so that the strawberry plants and flowers can be protected from the cold. The strawberry flower is a small wonder that turns into a wonderful delight by June. Without strawberry flowers, there would be no strawberries, so be sure to care for yours! You’ll reap the benefits of your vigilance. For more information on strawberry plants, visit the Strawberry Plant page. I moved into my current home and noticed wild strawberries growing in backyard with purple flowers. I have pictures. I was reading true wild strawberries have white flowers. Please help me identify them, they really do look like strawberries and can’t find anything on internet. I have 2 strawberry plants I got from Lowe’s about 1-2 months ago. I’m still learning how to take care of them properly. They seem to be doing pretty well, but some of the bottom leaves are turning yellow, and the flowers and buds keep turning brown. I started fertilizing them every other week starting three weeks ago. I thought maybe they weren’t getting enough sun because my yard is shaded half of the day. They get about 6 hours of sun a day. I really can’t move them because anywhere else the dumb squirrels get into them…any suggestions? Last year I planted a row of strawberries that look pretty good this year, but we had a frost a couple weeks ago, only down to 31 or 32 and I put row cover on. Now many flowers have brown centers (zone ,7b). Should I remove those do the plants don’t expend any more energy on them? We will be transplanting some strawberries to raised beds this year for better drainage and to reduce the weeds. While we’re trying to let them keep as much root as we can, their roots are obviously getting damaged as we move them. Should we pinch the flowers this year to let them recover? Hi. 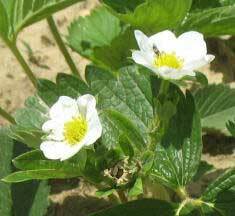 Your strawberry flowers have been damaged by frost and will not produce fruit. Pinch them off and there is a good chance the plants will produce more flowers and so fruit just a little later than expected. We have some strawberries that’s second year and many first year so far all plants look great but no flowers this year?.?? Give them a bit longer! Good luck! A few days ago I got an everbearing strawberry plant from my local plant store and it looked very healthy, and already had a flower with a dime sized strawberry. And I was just wondering if I should take off the flower thingies so the plant can grow or should I keep them? I took off the strawberry since it didn’t seem to grow and it was squishy and the it wasnt red, it was different colors like.. dark red, yellow and black. The plant is very healthy but for a small amount of time it has to stay in a place with partial sun (dont worry I’m gonna plant it in the soil with lots of sun). Um, but this is my first time caring for plants so I want to make sure I get everything right. It sounds like the berry was rotting, so you did the right thing by removing it. Good luck! I noticed ants on the flowers. Should I be getting rid of them or will they not be a problem? They shouldn’t hurt the flowers, but if any of your strawberries get damaged at all, the ants will set up shop and happily invade the damaged areas, often eating out the insides causing the fruit to rot rather quickly. You can try sprinkling a liberal amount of diatomaceous earth on the planting/berries. That will often work. Just rinse before eating! Good luck! It’s winter and my strawberry plants are flowering and look to be producing fruit. Should I take off the flowers? It depends on your climate. If your winters are very mild, you can go ahead and allow the fruit to set and try for a harvest. If it is just a warm snap, the weather returning to freezing temperatures will likely either kill the plants, cause other cold injury, or at least damage the fruit. If it is the latter, go ahead and remove the flowers/fruit. Good luck! My strawberry flowers have shed their petals and the green small centres are left. However, it has been quite a while, and the little green berries have not gotten any bigger. Do you know why this is happening and what I can do about it? Make sure they have adequate water, and just give them some time. They should start growing soon! Good luck! I’m glad you fixed the pest problem! I wouldn’t worry too much about the shortness of the flower stems. They should still set fruit for you. Good luck! Hello, I am caring for a friends garden and she has an incredible strawberry bed but no strawberry. Hundreds of healthy without fruit, this is an established bed. What should I do? If the plants are 4 or more years old, re-planting is probably the best bet. Otherwise, I’d check here. Good luck! I’ve been following your writings, and I am growing strawberries from bare roots that I plants about a month ago. I seem to be having a lot of luck, because there’s a lot of these pretty white flowers for me to pluck – about 20 each day on ~100 plants. I was wondering if there’s anything I can do with the flowers other than till them under. They smell great. Are they edible? If so, is the whole flower edible or just the petals. Can I put them in a salad and eat them raw or should they be prepared somehow? Also, I’ve been hand plucking them with no issues. Would it be better to cut them off, or does it not matter? They are edible, but not pleasant-tasting. I’d just throw them away or compost them. Hand plucking gently or snipping them are both acceptable methods. Good luck! I am in gulf coast of Florida and received bare root Sweet Charleys in November and now in January they are producing flowers. Does this article still apply to my plants? In Florida, a lot of growers use day-neutral June-bearing varieties for early harvests. If yours are producing a lot of flowers and have been establishing their roots for the last couple of months, you might want to just see how you do with the harvest. As far as the general information about strawberry flowers on this page, yes, it would still apply to your plants. Good luck! Do I need to pick fruit bearing flowers from 2nd year plants. Nope, let them produce a crop for you! Good luck! RE: Newly planted Ft.Laramie bare root Strawberries on 05/17/2016 > Vegetative growth is apparent but primarily reproductive. I am a published Master Gardener but have no experience with strawberries. My shipment was held in transit for 8 days before receipt and then I was forced to heel them in my basement for another week in which time they broke dormancy (barely visible new root growth). The plants appeared strong and healthy when planted. Although vegetative growth is already apparent, the aforementioned growth is primarily flower buds. Is this Normal or plant shock? Currently, I am removing the flower buds as they appear. ?????????? Usually, leaflets will emerge from the crown prior to the flower buds. But, occasionally, the flowers can emerge first also. I would just continue removing the buds as they appear, and watch for the leaflets. They should start within a few days. Good luck! Question. How many colors of strawberry flowers are there. I have both red and white but don’t know what that means and would love to know? Last year I planted 3 plants this year they they maximized themselves to 20. True strawberry flowers are all white. There are strawberry hybrids that have various shades of pink and red flowers (these are still considered strawberries, and some will even produce strawberry fruit). So, if you have both white and red, you have a few hybridized plants as well. Good luck! I bought and planted a variety of strawberry bare rooted plants online earlier this year. I potted them placing half in greenhouse and half outside to experiment as to where is best place for them to grow (I live in northern part of UK). Inside and outside earlier fruiting ones have started to flower and now I saw this week little berries starting to form. However, after reading the posts above I see the advise is to take out the flowers in year one. My question is – for the plants that have started to produce berries already is it too late to cut off the flowers and berries? Should I just let them continue and pinch out the flowers on the later fruiting ones when they flower? Since they already are fruiting, I would personally allow the berries that have already formed continue to ripen. However, it is best to remove subsequent flowers for greater harvest sizes in subsequent growing seasons. Good luck! We are in zone 10 growing 4 everbearing varieties in 8″ pots (conventional Seascape and Tristan, organic Loran and Mignonette), planted beginning of May. Due to neighboring houses there is only afternoon sun available on our property, and by mid-July the sun may be too hot for the plants to produce. Does it still make sense to remove their flowers until July? What are the benefits/drawbacks? So far the conventional plants have already produced a couple berries here and there, maybe 1-2 fruits per pot. With potted plants, I’d recommend leaving the flowers be and harvesting as many berries as you can! Good luck! Mr strawberry, why my strawberry plant stunned after pinching of the 1st flower?? I’m not sure what you mean by “stunned.” Can you clarify for me? Deer got into my back yard and grazed my strawberries to the ground! I can still see the crowns and short new green leafs. Will they survive? I have the following planted: Sequoia, Seascape, and Berries Galore. Yes, as long as the deer didn’t do any damage to the crowns, they should bounce back. Good luck! I planted a few strawberry plants last spring and they produced a small amount of strawberries. I believe they are all the June type. The plants spread quite a bit and filled the area I have them contained in, making lots of of new plants. This spring there are hundreds of flowers. Will these become strawberries? Much appreciated! Yes! Each flower will tun into a strawberry as long as pests or pathogens don’t intervene. Good luck! Just planted some earli bearers, chandlers, and Ozark beauty’s in Arkansas. This is my first time planting and I want to maximize the first year of berry production. Should I still pinch off the flowers or does that mean I’ll be left with no berries the first year? Can I just pinch them off until June and that will help production? I’ve got them in good draining pots. How do you know how much to water? I’ve read one inch a day but have no clue how to quantify that coming out of a watering spout. For the Chandlers, which are June-bearing, I would advise pinching off all the flowers this first year. That will make next year’s harvest substantially larger for you. For the Ozark Beauty plants, which are everbearing, you can pinch off the first set of flowers and let the second set of flowers go to fruit. Good luck! I bought an Ozark Beauty strawberry plant its small but when i got it, it already had a berry growing and a few other smaller ones starting to turn. Flowers are blooming on it and im confused if I should let them flower or cut off the flowers and berries? If you bought potted plants and are going to transplant them to a garden or strawberry patch somewhere, I would snip off the berries to allow for better root development. If the strawberries are going to stay in the pots and have been established for a while, I’d just let them set the fruit and enjoy the harvest! Good luck! Should I remove strawberry flowers in the fall that you know will not produce ripe fruit before the cold weather appears. Will it allow more energy to my green unripe berries? Yes, that is a good idea. Good luck!